You will earn 6,750 Reward Points. Earn 1 reward point for every 1 dollar spent. Stainless steel front, sides, top and legs. One year limited parts and labor warranty. 50,000 BTU/hr. burner per section, 100,000 BTU/hr. total. Five nickel plated oven racks with eleven rack positions per section. Independently operated stainless steel doors with double pane windows. 3⁄4" rear gas connection with combination gas pressure regulator and safety solenoid system. 1⁄2 H.P. two speed oven blower-motor. 120/60/1 with 6' cord and plug. 8 amps per section. 16 amps total draw. Control panel mounted on left side of oven. Second year extended limited parts and labor warranty. 208V or 240V, 60 Hz, 1 ph, two speed, 1⁄2 H.P. blower motor. Down draft flue diverter for direct vent connection. Flexible gas hose with quick disconnect and restraining device. Consult price book for available sizes. 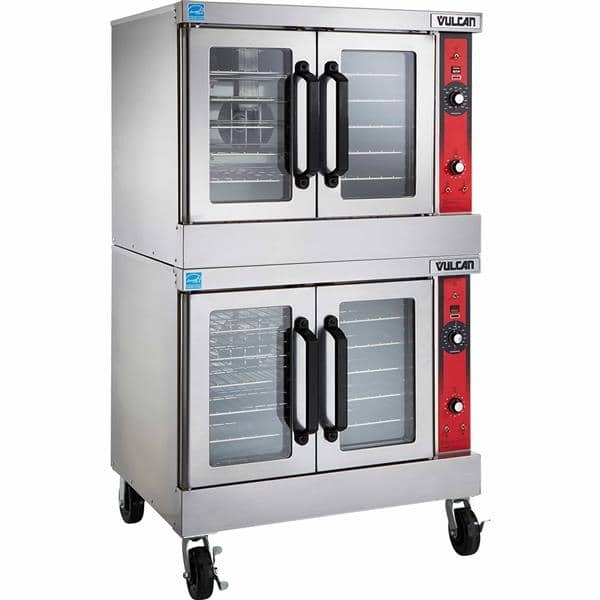 Double section gas convection oven, Vulcan-Hart Model No. (VC44GD) (VC44GC). Stainless steel front, sides, top and legs. Independently operated stainless steel doors with double pane windows. Non-sag insulation applied to the top, rear, sides, bottom and doors. Porcelain enamel on steel oven interiors measures 29"w x 22 1⁄8"d x 20"h. Two interior oven lights per section. Five nickel plated oven racks per section measure 28 1⁄4" x 20 1⁄2". Eleven position nickel plated rack guides with positive rack stops. One 50,000 BTU/hr. burner per section. 100,000 total BTU/hr. Electronic spark igniters. Furnished with a two speed 1⁄2 H.P. oven blower-motor per section. Oven cool switch for rapid cool down. 120 volt, 60 Hz, 1 ph power supply required. 6' cord and plug. 8 amps total draw per section. NSF listed. 3⁄4" rear gas connection with combination gas pressure regulator and safety solenoid system. Oven cool switch for rapid cool down. One year limited parts and labor warranty. 1 / H.P. two speed oven blower-motor. 120/60/1 with 2 6' cord and plug. 8 amps per section. 16 amps total draw. Electronic spark igniters. 50,000 BTU/hr. burner per section, 100,000 BTU/hr. total. Five nickel plated oven racks with eleven rack positions per section. Stainless steel front, sides, top and legs. Independently operated stainless steel doors with double pane windows. Porcelain enamel on steel oven interior. can it be used for residential use with a warranty? Vulcan does not honor their warranty if the oven is used in residential settings.